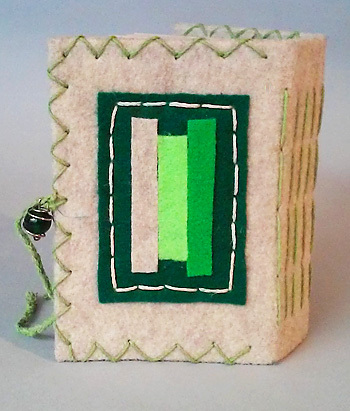 Beyond adornment…ribbon can add mystery, privacy, secrecy…to a piece. 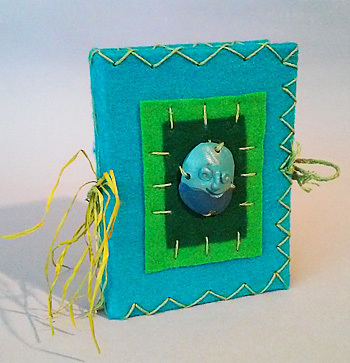 When tied shut with a ribbon, an extra effort is required to open the book, and plummet its depths. 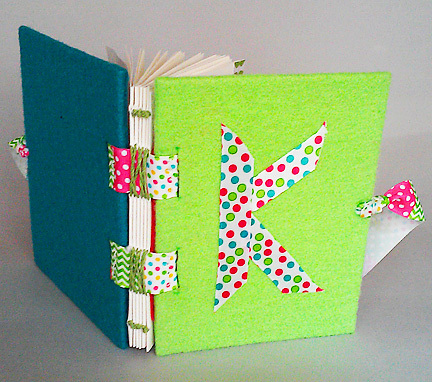 Single signature with stitched ribbon. 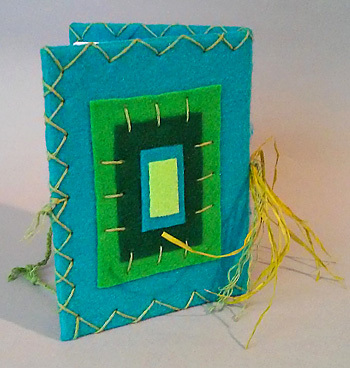 Single signature with glued ribbon and stitched edge. 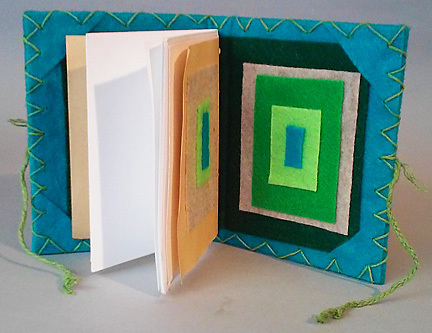 Front and back inside cover ribbon framing. Ribbon closure with button and and stitched buttonhole. 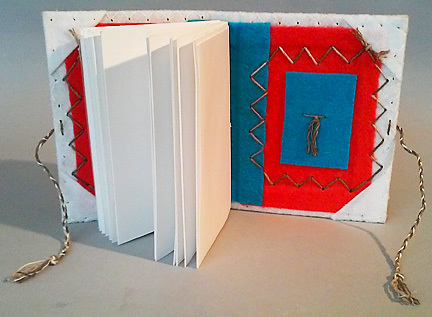 Tied ribbon, woven ribbon, glued ribbon. 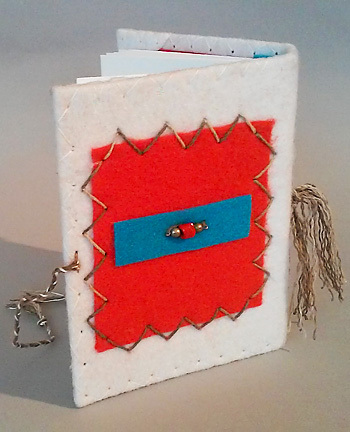 Woven and wrapped ribbon with repurposed felt button closure. 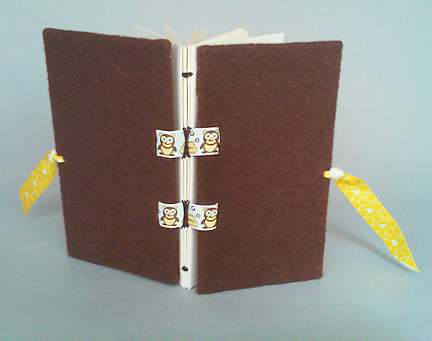 Accordion book ribbon ties using two ribbons. 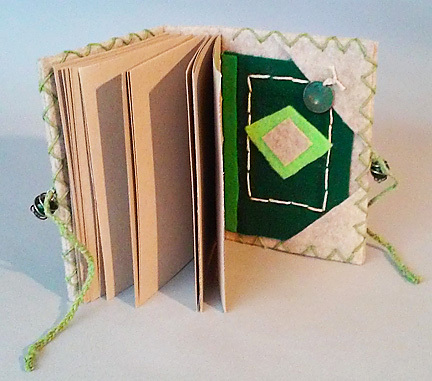 Accordion book ribbon closures using one ribbon. 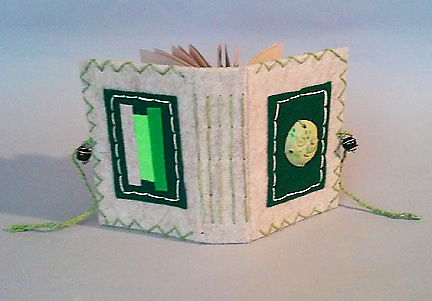 Accordion book ribbon glued under cover adornment. 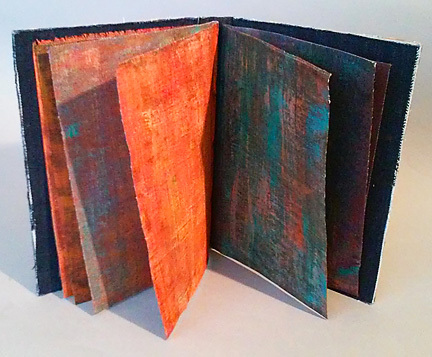 Painting on denim, reading color, the ties that bind, the vocabulary of color. 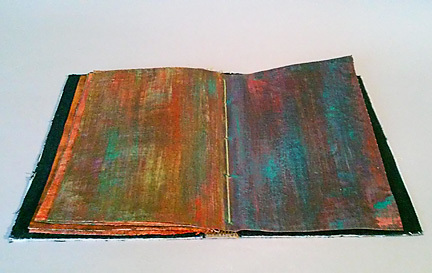 These are themes that come to mind when creating “painted books”. 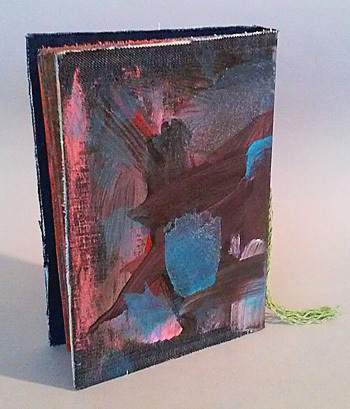 A multiple signature book, bound with hemp cord, covers of board covered with painted denim, pages made of painted denim bifolios. One piece covers front and back covers, and spine piece. 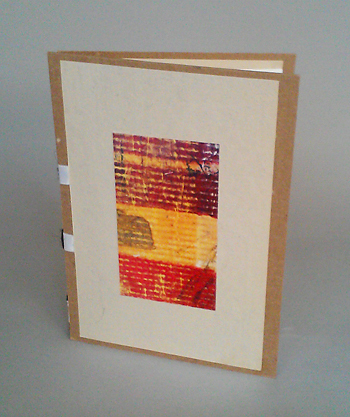 Creating a book with a painting.. 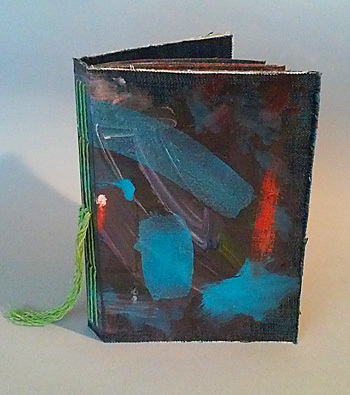 Inside front cover is unpainted denim, overlaid with painted piece. 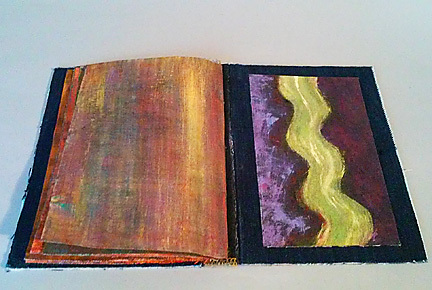 And a river runs through it…when do the elements of shape, texture and color come together to create an image that would be interpreted by the viewer as in generally the same way? When does a collection of elements become a “thing”? 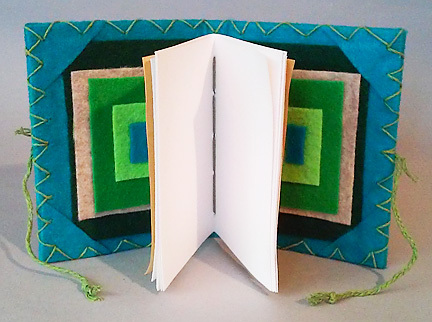 I have already posted about learning the “French Link” binding technique, twice. 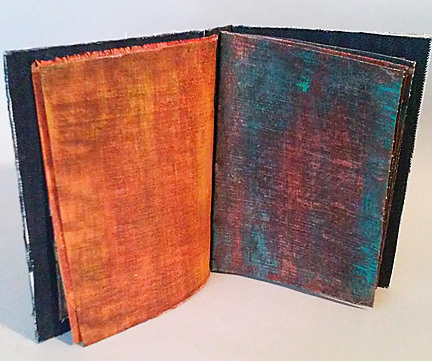 But here I wanted to take a look at the bound backs, aka, the “spines” of my explorations of this binding, and see how they play as a collective grouping. Sample…sometimes the little “models become the pieces I like the most. 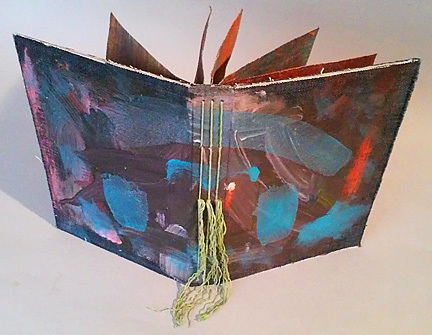 This practice piece is made from repurposed board, newsprint, paper image, cord and ribbon. 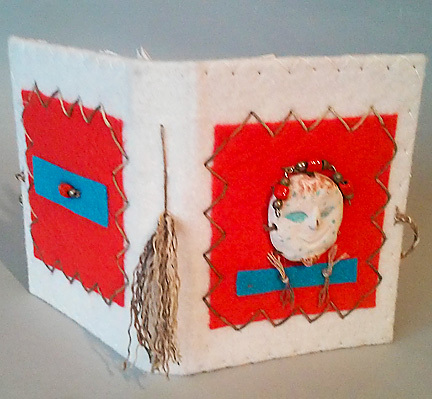 I don’t think I am alone in being fascinated by groupings, collections, series, and other means of seeing how singular parts can come together to create a unique whole. A group of things brought together will often become something wholly different ( pun intended) then (indeed transcend) the sum of its parts. 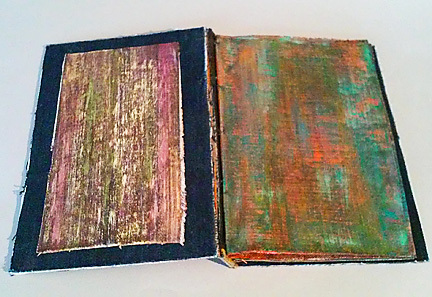 Here then, I peruse my forays into The French Link, (a form of Coptic binding) as a way of exploring not only the technique itself, but also this phenomena of parts coming together to create new meanings, often unintentionally. 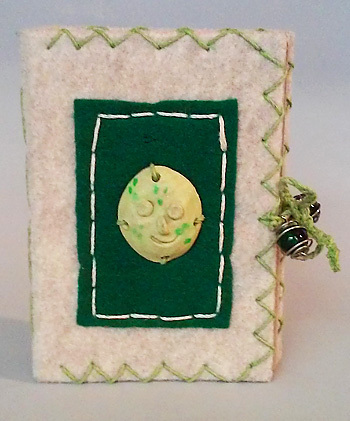 The book I made in the class. with covered boards and 6 sections. A bit wobbly with only 2 connector ribbons. 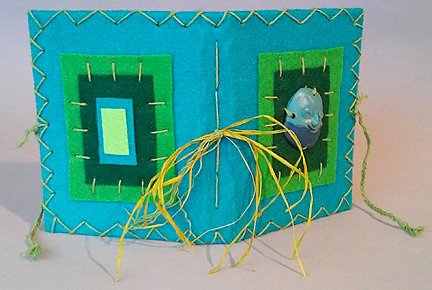 Seeking to heal the “wobble”, I added a third connector ribbon (my nomenclature), and two more ribbons to tie the book closed. 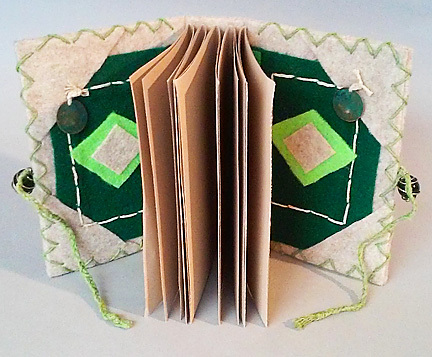 Made of board covered with Eco-fi felt , repurposed paper, hemp cord, and ribbon. 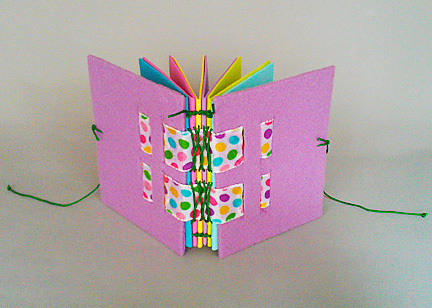 Continuing the polka dot theme…this two connector ribbon book was made in honor of an eight-year-old’s birthday. The thickness of the ribbons also helped with the wobble. 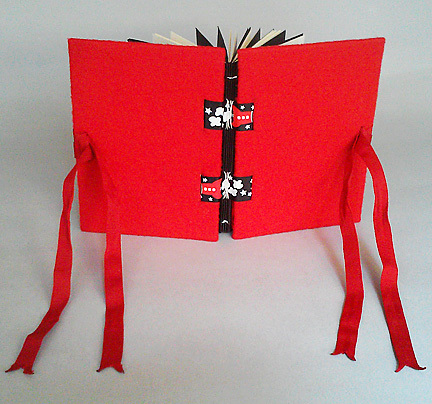 Red and black book fit for a warrior, and one turning six, who is fascinated by outer space. 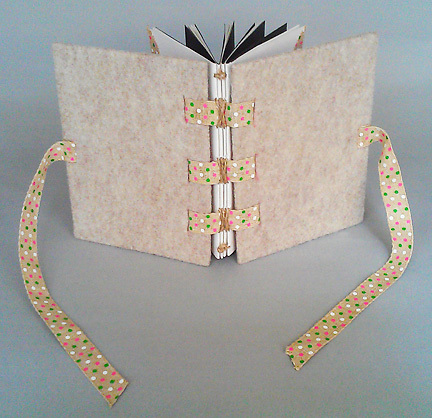 Because the “space” connector ribbons have such bling, I used thin off-white linen thread for the stitching, so as not to compete. 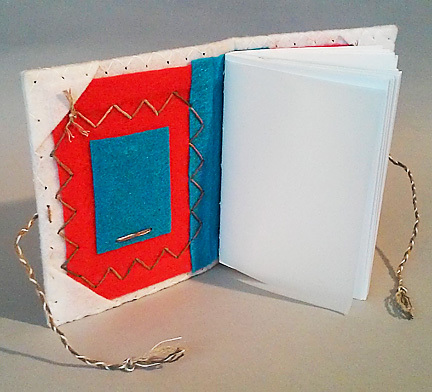 Wanting yet more polka dots to show, I added some slits to the covers of this book to weave the connector ribbons through, thus adding strength to the structure. 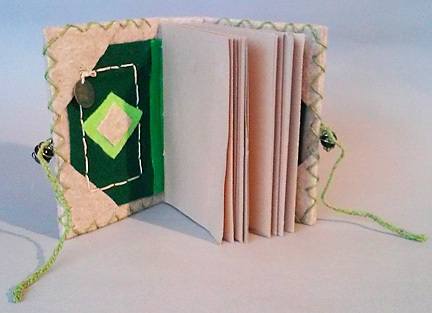 The pages are made of foam sheets, all the better for the three-year-old owner. 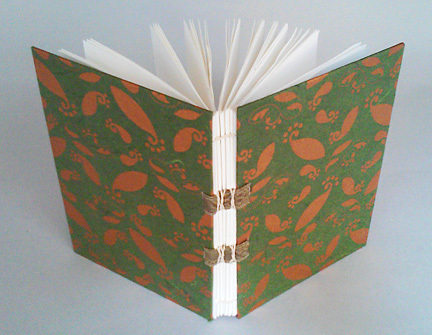 Inspired by the bear, this book is a plain, brown, bare ode to the bear, a favorite ‘spirit animal” in our household. Made from bits and pieces of this and that…one of my favorite ways of working. With books, that is. 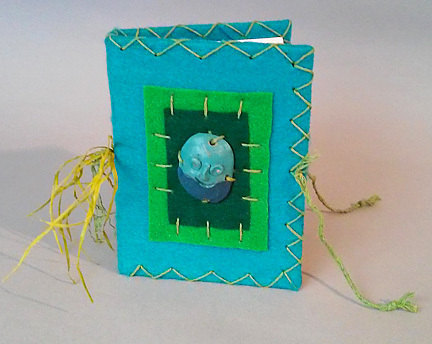 As I continue to delve into the rich and endless world of bookmaking as an art form, separating works into groupings lends some sense of direction and organization around the process, a container for limitless exploration. Looking at books from the back can be an interesting vantage point. I have their back, so to speak. And so do You.